The beautiful birds fly gracefully. The beautiful birds fly gracefully toward the horizon. Even with all the modifiers, this is still a simple sentence composed of a subject (birds) with its modifiers (the, beautiful) and a predicate (fly) with its modifiers (gracefully, toward the horizon). Words required to complete the meaning of the predicate of a sentence are known as complements. The fragments above are lacking necessary complements. There are five kinds of complements. Three of them are used with action verbs only: direct objects, indirect objects, and object complements. Two others, called subject complements, are predicate nominatives and predicate adjectives. Subjects complements are used only with linking verbs. The selfish child grabbed the toy. The boy gave Sarah the toy. Sarah gave her doll a hug. The class elected Stanley president. I called Wayne an egghead. Mr. Wilson is my history professor. A predicate adjective modifies the subject of a linking verb. The sentence above could also be completed with a predicate adjective. All sentences have subjects and predicates. Many sentences also have complements, and you just learned to spot all five of them. Piece of cake, right? Where Does the U.S. Rank in the List of Most Educated Countries? I enjoy read English so much, but sometime become confused when my instructor mention the topic paralled structure, could you please explain to me in more details. thanks for your support. Great site. I have a question about noun modifiers. Here in Asia, students learning to write have a hard time with these sentence structure. There’s not much on the web about noun modifiers. Any ideas for teaching plans? Hello sir, your passion to teach young people is worth praising. And this presemtation of five kinds pf complements is very informative. Easy to learn and well explained. My question is on the constructon of complex sentence. It carries main and surbodinate clause. So ,must the surbodinate claue be adverbial clause or it can be any;noun or adjectival clause? Sendly, is there any difference between verb phrase and phrasal verb? please I want to know the functions of a prepositional phrase because it sometimes confuses me.Again,In a statement like ‘I went to Lagos with my friend’,what is the function of ‘with my friend’ in this statement? It is an adverbial phrase modifying went. Prepositional phrases function either like adverbs or like adjectives. Good morning sir!Please I want to know all the grammatical functions of prepositional phrase because it sometimes confuses me in terms of identifying its functions.My question again is on this sentence’I went to lagos with my sister’,what is the function of ‘with my sister’ in the sentence.thank you! What function is “helping” serving? That’s a tricky one. My best guess is that “helping the customer” is a gerund phrase. What’s weird is that it seems to modify the adjective “busy,” but gerunds are always nouns–how can it function as an adverb here? Well, I think it’s an elliptical phrase–a kind of shorthand. I think when we say this, we are leaving out the preposition “with” (The clerk was busy with helping the customer.) That would make “helping the customer” function like a noun–the object of the preposition. It would be the same with sentences like..
They’re bored talking to him. This page helped my 7th grader on his semester assessment. That’s great to hear! Thanks, Loren. The Five Sentence Complements really helped my 7th grader on his semester assessment. Yes sir,it helped!I have now gotten it well,I will ask anytime problem arises regarding grammar,thank you! I have gained a lot from the above piece of grammatical items,my question is:when a gerund follows a linking verb,what is the grammatical function of the gerund as in he is playing,she is cooking and so on. It is possible to place a gerund after a linking verb: “My favorite activity is swimming.” In a sentence like this, “swimming” is a noun serving as a predicate nominative. wow! nice piece ,extremely valuable ..bravo! Brain! This is a good passage but it didn’t help me,but thanks for you time and effort into this. Thanks for your input, Mark. First, the distinction between action and linking verbs is different from that between stative and dynamic verbs. I don’t discuss the stative/dynamic distinction here. In terms of action/linking, “like” is simply an action verb, so I would dispute your first point. You are right about your second point, however. I had not considered adverbial complements before, but your “She is in New York” is a good example. Thanks. Hi Brian, I just wanted to make a couple of comments. First, you and many others claim that only action or dynamic verbs can take an object. However non-linking stative verbs do take objects too, as can be seen in the simple example “I like cookies.” Secondly, there are such things as adverbial complements because there are times when adverbs are needed to complete the meaning of a sentence; such as in, “She is in New York.” True adverb complements are required, while non-essential adverbs are just modifies (as you pointed out), but this nit-picking serves little purpose in practice. The basic syntax of a sentence is subject-verb-complement, so in this broader sense, anything after the verb can be considered a complement. 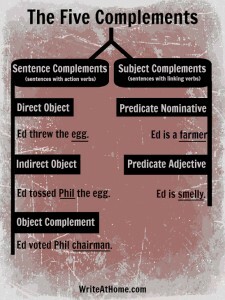 This is shown in the paper entitled “The Structure of the English Sentence,” by Manuel Palazon and Marian Aleson where various adverbs are shown as examples as complements; for instance, “Are you the student whose exam was lost last year?” with “last year” listed as a complement, even though the sentence is still grammatical without the “last year.” I’ve taught ESL for fifteen years and always teach subject-verb-complement syntax with the complement part just being anything at all that completes the sentence, or simply everything that is part of the predicate excluding the actual verb. This works fine and everyone understands. So, you might want to consider expanding your list of complements to include adverbs as well. You have explained that there are five types of Complements in general. But, I have a small but valuable doubt. In the sentence, “He remains silently”, what type of role played by the complement “silently”? In your sentence, “silently” isn’t a complement. It is an adverb modifying the verb “remains” and therefore part of the complete predicate. Does this allay your valuable doubt?